Good morning to you all, I hope you have sun and you're all out enjoying it!!! In case you didn't read it over at Shoestring's facebook page. I am sending you my apologies for being absent for so many days with no word, but my back went out and I wasn't able to let you know or work on any of my "projects". Prayers have prevailed, again!! and I am back here at my keyboard to share with you all!! However, believe it or not, my first passion is, and has always been, cooking and baking ( I'm sure I get this from my Grandmother) Therefore, I just sat myself down determined to find out what 'universally friendly' foods I wanted to make so that all here were fed well and enjoyed the experience. "A Brunch-themed dinner" seemed to be what kept coming to my mind. Who doesn't love Brunch? 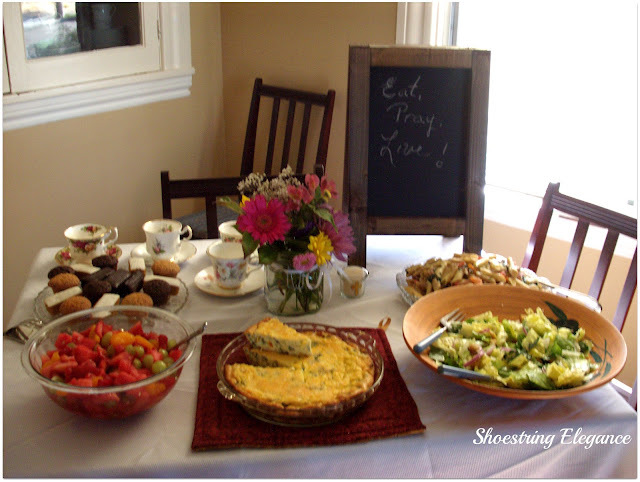 Plus, I knew I had created some pretty memorable Brunch meals in the past that had always been a hit. So I wrote out my Menu. It was a warm day, so the first thing that came to mind was ***Cucumber Water ( a new find for me ) and I just Love it...such a simple thing as placing sliced cucumber in your water pitcher, makes your water so much more ...hmmm .. more watery(?) no...Refreshing! That's the way to put it! I can't get over how much difference this small step makes. 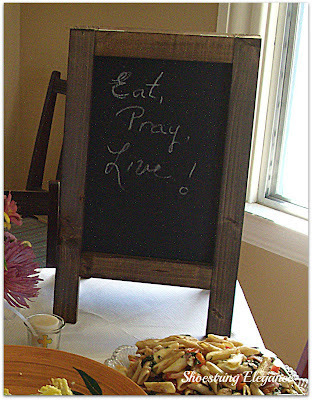 Little sidebar here, I must tell you that I won Cottage In the Oaks little tabletop Chalkboard Venue from Courtney at French Country Cottage and I was so excited (I never win anything) to use it for this, it was the perfect time and reason to do so... Doesn't it look Grand? The Group, the people, the prayer and food all went well!! I thoroughly enjoyed the evening! So, I guess we can call it a success, I had very little leftovers so my menu was a hit. Most importantly, was the wonderful fellowship I enjoyed that evening!! What a wonderful group of people that I look forward to seeing again next month! I hope you are all as Blessed as I have been to have people like this in your life!! The recipes are my own, tried and true, as My Grandmother put it! If you are interested in one of them shoot me an e-mail. (I'm hoping to find a way to post them here, but not in the actual post). I hope you all have a wonderful week, full of bounty and blessings!! Thank you for taking a few minutes to share with me. Hi Theresa! I think your blog is great..I will be trying the cucumber water..I am not a big water drinker, but this will make it fun!! Sounds like you had a great time. Yes, thank God for good friends and fellowship! Thank you for sharing with us at The "Sunday Stop". They are so important aren't they? Thanks Bj! Yumm! Sounds like a fresh and delicious meal! Karen and Kathy, Thank you both for your kind words and well wishes!! Very much appreciated! Theresa, Blogspot has a way for you to add recipes not withing your postings. You can add "pages" to the blog. Skip over to my blog and look just below the header and before the post. There are "tabs" and you click a tab and it takes you to a page. You could have a "Recipes" tab and page. I think you are allowed up to ten different pages. If you need clarification, holler and I'll try to help you out. Your Eat, Pray, Love was a success! Awesome! 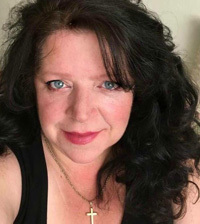 My blog: http://nancylhoefer.blogspot.com. Nancy, I sent you a reply earlier I don't know if you got it or not. But, Thank you and I will definitely be hitting you up for some help in that! Thanks for your kind and informative words! Sounds delicious! You put a lot of work into this and I'm sure it was really enjoyed. Your brunch looks delicious! I love a good brunch, especially Frittata! 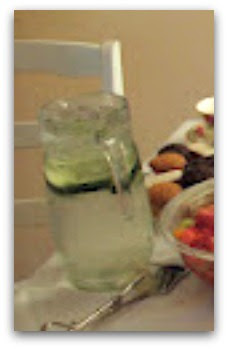 I have never had cucumber water but I would imagine it is Quite refreshing. Thank you for sharing with us and joining me for tea today. Hope you have a lovely week. Hey, Sandi! Thanks for having me for "Tea" I hope you try the cucumber water, It's delicious! Yep, Frittata has to be one of my favorite 'go-to' recipes!! Hello Theresa, it sounds and looks like you had a perfectly lovely "brunch"! Thank you for sharing your special evening with us at Heart & Home. Thanks, Trish! You're right, it doesn't get much better!! Thanks for having me @ your Heart and Home!! Nice post. Have a good day. Thanks so much for all your kind words, Marty, Carole and Beth!!! more than you'll ever know. :) The Life group went great! Many Blessing to you and yours, as well! I used to do a lot of cooking, but not anymore. It is not worth it far just one. I let the other family members cook and I enjoy it. So sorry about your back. Back pain is a terrible thing. Hi, Meme!! Yes backpain is difficult, but I've been dealing with it for a long time no and prayer really has been and is the answer for me. As for the cooking, I still cook quite a bit, I just invite people over to share it with me. It is such a pleasure to create in that way, too. Get well soon! Your food and table look and sound great! Cucumber water, who thought of that! Thanks so much Susie!! Try the water, you'll like it!! Katie, So Glad to be a Part of your HOP!!! Thank you so much, Debbie, I'm so glad people understand. Definitely not by choice, here. I hope to be hooking up with you @ Toot Your Horn Tuesday blog next week with a great new project and post!! Hi, Tamika! It is wonderful! To answer your question, no I don't think that the water has a sweetness to it, unless you think cucumbers are sweet. Difficult to explain, give it a try! Unless you HATE cucumbers, I think you will be pleasantly surprised @ how good this is! !